If you’re after a graceful and tranquil venue, then look no further – Stationers’ Hall situated in the heart of the City is just that. 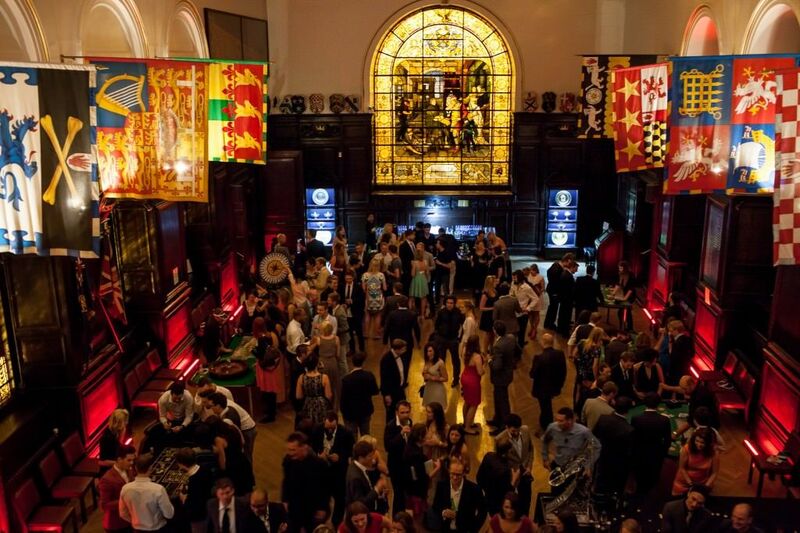 Popular events which have taken place at Stationers’ Hall have been: meetings, receptions, dinners, ceremonies, parties and more. 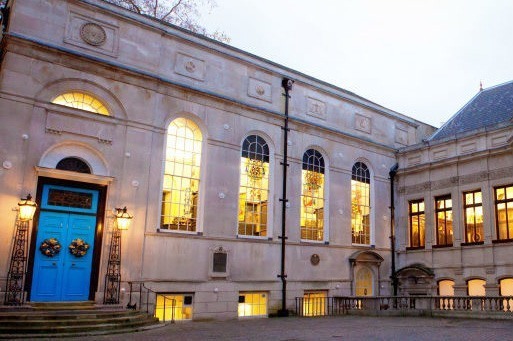 The Hall is one of the only few ancient Livery Halls which are still around today in the City of London. There are various rooms available inside of it which are available to be hired for corporate and private functions. In 1403 The Major and Aldermen of London agreed the creation of a fraternity or Guild of Stationers. Originally The Stationers were booksellers who would copy and sell manuscript books, however this changed in the early 16th Century after printers had joined the company, who took over from the manuscript trade. The Company in 1557 was given a Royal Charter to become the 47th Livery company – it was initially based in Peter College. However, in 1606 the Company changed location and moved from the college to Abergavenny House. Abergavenny House was sadly destroyed during the Great Fire of London in 1666, but was reopened in 1673 with interiors which look very similar to todays. Additions have been made along the way, for instance the Court Room was added in 1748 and the façade in 1800 was remodelled to its present form. The largest of all of the rooms inside Stationers’ Hall is the Livery Hall – an impressive space, filled with oak interiors. 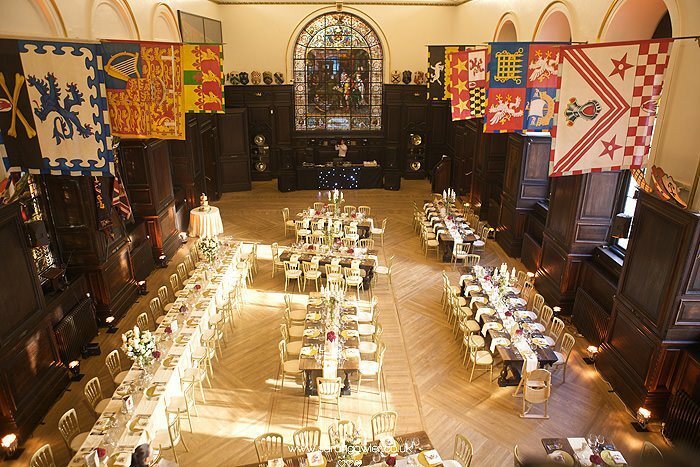 The Livery Hall is a well-lit, spacious room and features huge stained glass windows, which portray figures such as William Shakespeare and St Cecilia. Another bright room located inside of Stationers’ Hall is The Court Room. It is lavishly decorated in a Rococo style and displays a mantelpiece from the 18th Century – its centrepiece. Attached to the room is a balcony which has a view of the gardens which are located below. Whilst the Court Room is not brilliant for events which involve dancing, it is still one of the favourite spaces in the City, particularly for meetings, seminars and receptions. The room can hold up to 16 guests for a reception event, or 90 for a seated dinner. During the warmer months, both the Court Room and the garden can be used in conjunction with each other. 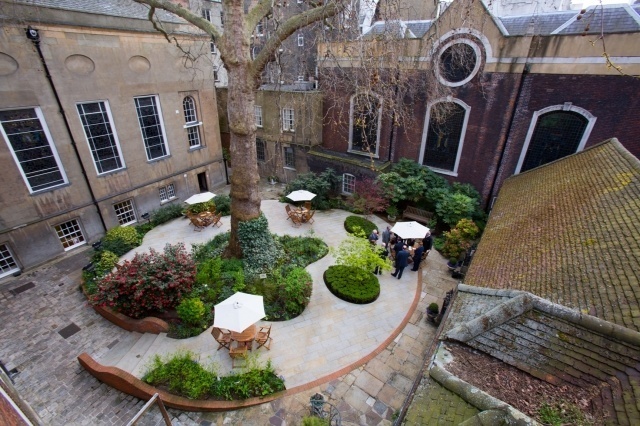 The garden can equally be hired out separately as well, accommodating up to 250 guests and can be fitted with 4 small marquees.​Another room inside of Stationers’ Hall available for hire is the Ante Room – this is a small room, which has a maximum capacity of 20 people. The Ante Room is a charming room which has been beautifully decorated with traditional furniture and ornaments. 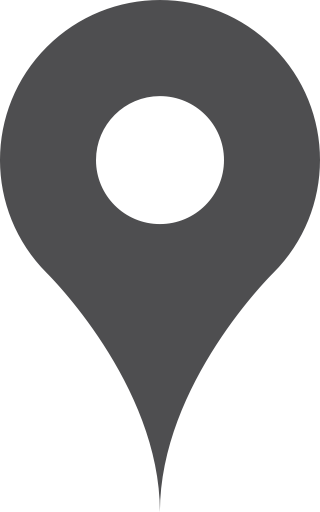 This particular event space is perfect for small scale events, such as dinners or meetings. The Stock Room is a room which dates back to the 17th Century; it is designed with oak panelling. It is especially ideal for small scale events, with its maximum capacity of 100 standing guests and 60 seated guests. In addition, the Stock Room can be used in conjunction with the Hall or Court Room as a breakout space or a reception area. The last of the spaces is the Crush Landing space which can host up to 100 guests for a reception.